These no-bake Pink Lemonade Icebox Pie Squares with Golden Oreo crust are cool, light and refreshing for those hot summer days. Do you ever wonder how you live as long as you do, cook as long as you do and still find new recipes to try? The recipe I have for you today is one of those recipes for me. Have you ever had lemonade pie? Last summer I tasted lemonade pie for the first time. I had never even heard of it before I tasted it. And I’ll be honest. I wasn’t sure I was going to like it. It only took one bite to convince me, though. Cream cheese, Cool Whip, lemonade…there’s not much to dislike about that, am I right? This icebox dessert is super easy to throw together and is great for summer because it is no-bake. To make it easy to serve, I lined an 8×8 baking pan with parchment paper. I liked doing this because then I was able to cut the dessert in neat, tidy squares. Sometimes it is all about the presentation, ya know? The second reason I used parchment paper was to keep the pan clean. You’ve got to love a dessert that requires no pan scrubbing. You don’t have to use parchment paper, though. It is completely optional. The crust is made of crushed Golden Oreos and butter. Crush up about 22 Oreos and mix them with 1/2 a stick of softened butter. Press this mixture into the bottom of the pan. It’s not completely necessary to use a stand mixer for this recipe, but I did just to make it easy. The least amount of arm power is the best way in our house. Sometimes when you are working with cream cheese, it is hard to get the cream cheese blended enough so that there aren’t chunks. I wanted the cheese completely smooth, so I put it in the stand mixer bowl and beat it for a minute or two until it was fluffy. Then I added the sweetened condensed milk and lemonade concentrate. I also added a few drops of red food coloring. I wanted my Pink Lemonade Icebox Pie Squares to actually be pink. You can leave out the food coloring if you don’t care about the color. When it comes time to add the Cool Whip, use a rubber spatula and fold it in. Don’t mix it with the mixer or it will overmix and your Cool Whip won’t be fluffy! Pour this mixture over the Oreo crust and refrigerate for at least 4 hours or until it is set. You may have a few leftover golden Oreos in your package. At this point you can take a mini-break, pour yourself a cup of milk and dunk away. No one will know the difference! Enjoy this refreshing dessert this summer! 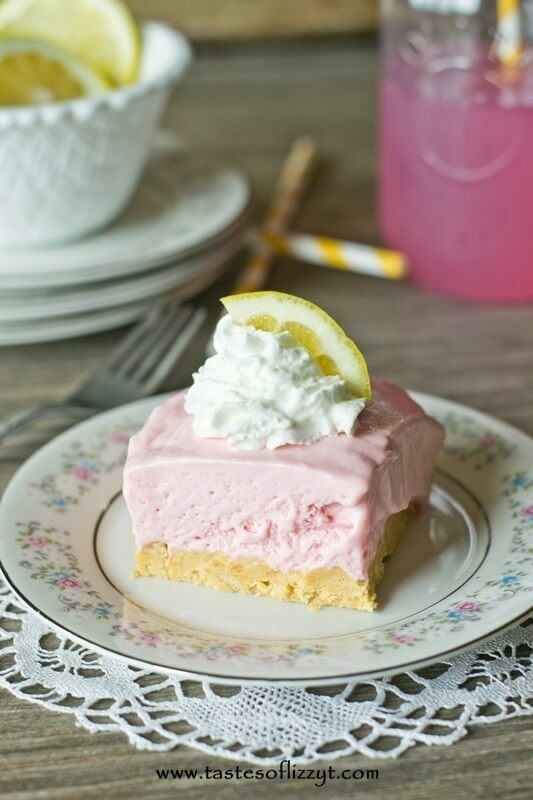 This no-bake Pink Lemonade Icebox Pie Squares with Golden Oreo crust is cool, light and refreshing for those hot summer days. Line an 8x8 baking pan with parchment paper. Mix together the crushed Oreos and butter. Press this mixture into the bottom of the prepared pan. In the bowl of a stand mixer, beat the softened cream cheese for 1-2 minutes until it is fluffy and smooth. Add in the sweetened condensed milk, pink lemonade concentrate and red food coloring. Mix well. Fold in the Cool Whip. Pour this mixture over the crust and refrigerate for 4 hours, or until set. Cut into squares and serve. Refrigerate the leftovers. They look great! I make a similar recipe with the same filling mixture but with Ritz crackers as the crust. The salty/sweet thing. Love the white Oreo idea! Will have to try that next! I love the idea of a sweet/salty combo. That’s definitely something to try next time. Thanks, Averie! This looks so yummy! I’m definitely pinning this! Visiting from the Happiness is Homemade link party. This looks so yummy. I’m definitely pinning this one. What can I use instead of the concentrated lemonade?.and is cool whip cream? You could use any concentrated juice instead of lemonade. Cool Whip is whipped topping. You could make your own using whipping cream and powdered sugar. Oh wow. Oh wow. That looks so good! Holy cow! This is like a pink lemonade cheesecake. I have got to try this recipe soon!!! I would love it if you linked this up to my Motivate Me Monday linky party! Thanks, Katie! Yes, we love the cream cheese flavor in this dessert! This looks so yummy and refreshing, perfect for a hot summer day. My daughter makes a variation of this cake and we love it! Thanks so much for sharing this at the Friday Frenzy! Marcie, this was one of our first icebox pies, too! It was so easy, though. Great for these hot days! I made these and they were excellent. I chilled the crust in the fridge for an hour as well as the filling (before adding the CoolWhip). After letting the two set, I added the CoolWhip, assembled and then refrigerated for 3 hours. They were devoured. Thanks! Excited to try this! Going to make it gluten free…going with gluten free cookies for the crust…will report back! I love the idea of making it gluten free! We are trying to bake with more gluten free products. Let me know how it works! I used gluten free oreos – though they are expensive and only come 18 in a pack (7.95 at Whole Foods)…. I used Wegman’s store brand pink lemonade because they say it is gluten free whereas other brands won’t necessarily guarantee it (from what I read on the internet). In our case, if it says gf, it’s usually okay for the person who needs it gf but some folks have super severe allergies so that is why I like Wegman’s brand. Very excited to make this again! !